We are a team of experienced sedation dentists in Stoke on Trent who are familiar in treating patients of all anxiety levels. We are happy to offer you the best dental care to ensure that you have the confidence to maintain your oral health. We will always try our best to explain everything in advance to you and also do our best to make your treatment as comfortable as possible. If you are very nervous about dental treatment, we also offer sedation dentistry, which uses medications to help patients relax during dental procedures. This is a prescribed drug, which is administered either by an injection or as a gas, which you breathe in. We have an excellent support team to ensure that you are well looked after. We are also accepting referrals from local dentists who do not offer sedation to their patients. Sedation is excellent for the extremely nervous or patients who have a dental phobia. We use a sedative agent to relax the patient. This can be in the form of nitrous oxide which can be inhaled or as midazolam which is administered by injecting into the back of the hand. These techniques are proven to be very safe and all our staff meet current GDC guidelines for sedation. The sedative induces a state of deep relaxation and a feeling of not being bothered with what is going on. Some people say it produces a floaty feeling as if they had a few glasses of wine or they feel sleepy. We perform intravenous (IV) and relative analgesia (RA) sedation which is the gas and air that is administered during childbirth. Am I knocked out during sedation? No you’re not! General anaesthetic is only available in a hospital setting now and majority will not carry out routine dental procedures. The sedative induces a state of deep relaxation and a feeling of not being bothered with what is going on. Some people claim it makes them feel like they are drunk. We have treated many dental phobics under sedation and majority of them are extremely satisfied with what we have to offer. Why Kidsgrove Dental & Implant Centre? 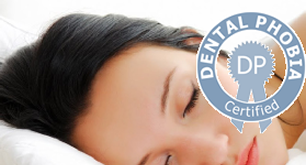 All our staff are fully trained to perform dental treatment under sedation. Dr Gary Wu has over 10 years experience at treating patients under sedation and has treated over 500 patients with these techniques. We are very fortunate to have the facilities to provide both inhalational as well as intravenous sedation. We also have a vast range of dental treatments in the practice therefore whether you would like some fillings placed or even dental implants then this is all carried out by Dr Gary Wu. We will also ensure you have the best care ever! Treated with dignity, respect, patience and quality dentistry. Dr Gary Wu is a Dental Phobia Certified dentist Click Here to verify.